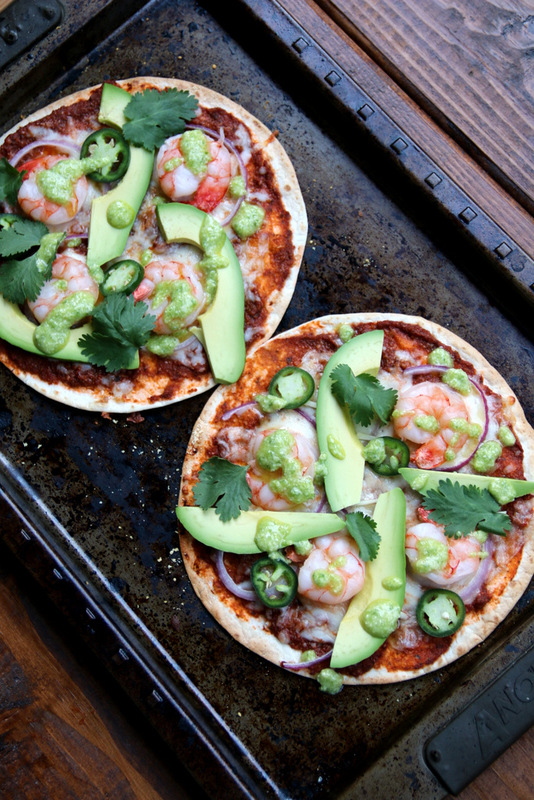 These Mexican style tortilla pizzas are made with flour or corn tortillas and topped with tomato or bean sauce, mozzarella, parmesan, plus your choice of toppings including chorizo, chicken, shrimp, veggies, avocado, jalapeños, cilantro, and more. 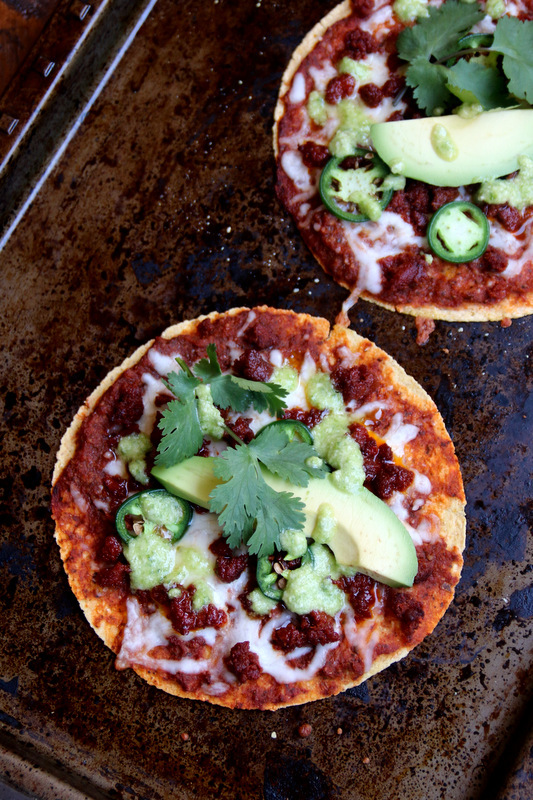 Tortillas pizzas are a great option for an easy weeknight meal. 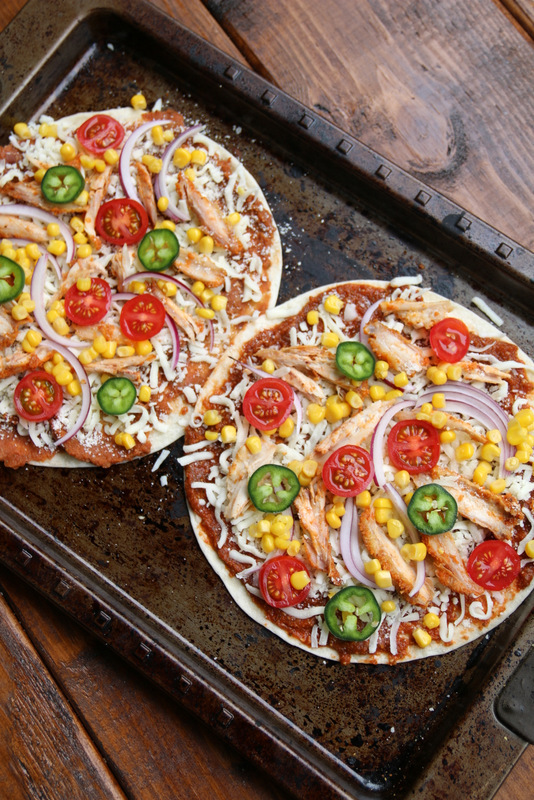 You can make the sauces and prepare the toppings ahead of time, this way it’s just about assembling and baking these delicious Mexican style pizzas for a quick dinner. 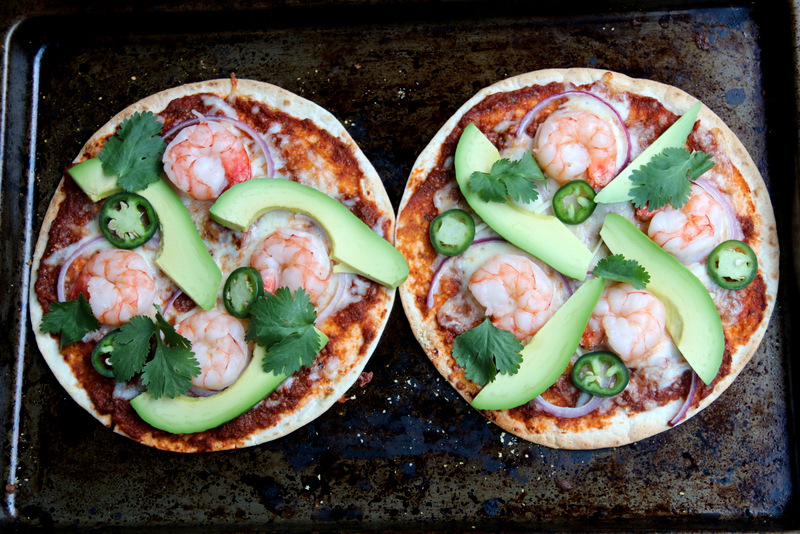 Another thing I love about these tortilla pizzas is that each person can customize and choose their own toppings, so you don’t have to deal with the dreaded “I don’t like X ingredient”. 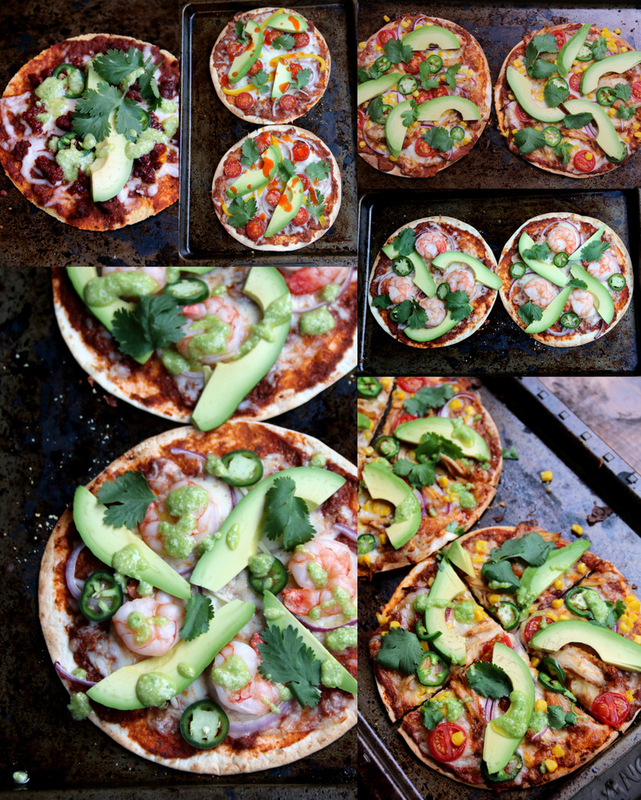 It’s also fun to see the different topping combinations that everyone comes up with. 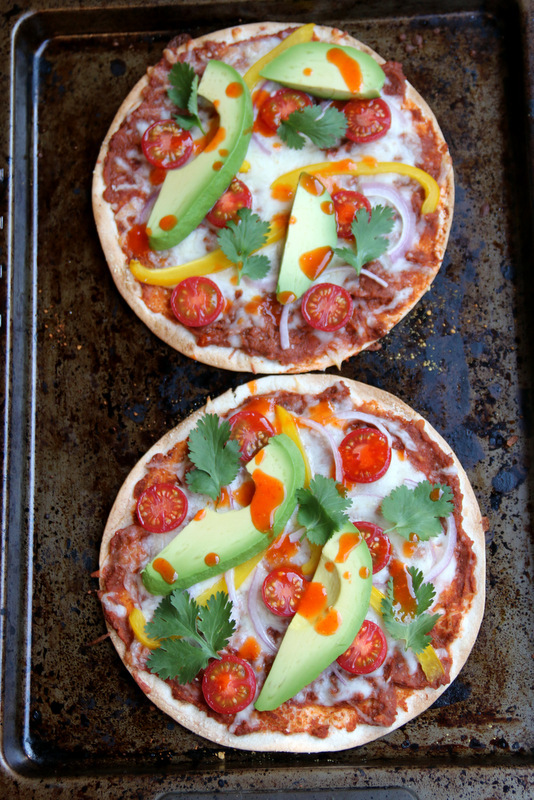 These quick pizzas are filling enough to make a full meal, but can also work as a quick appetizer or snack option. 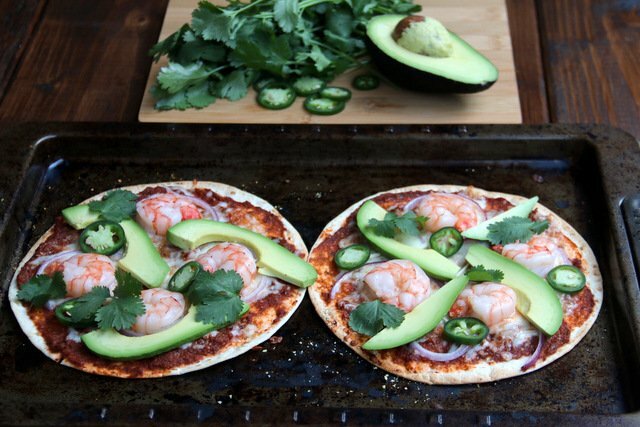 Recipe for Mexican style tortilla pizzas made with flour or corn tortillas topped with tomato or bean sauce, mozzarella, parmesan, your choice of toppings including chorizo, chicken, shrimp, veggies, avocado, jalapeños, cilantro, and more. 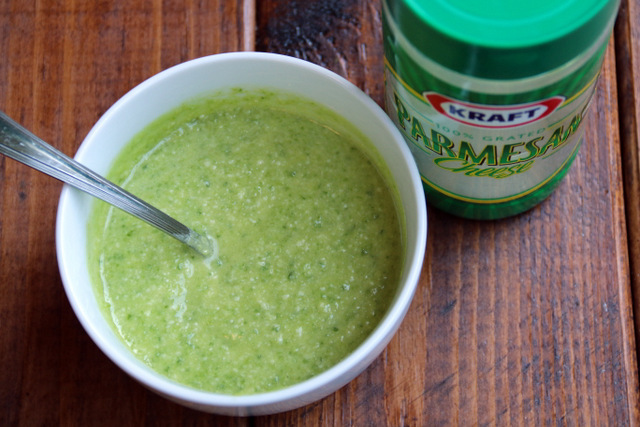 Combine all the ingredients except for the parmesan cheese in a blender and puree until you have a smooth sauce. 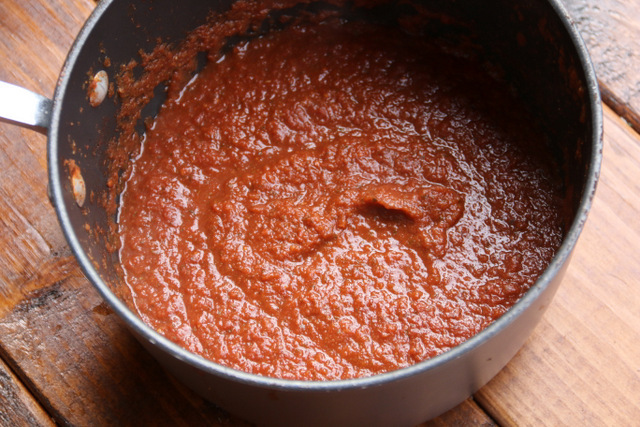 Place the tomato puree in a saucepan and bring to a boil, reduce the heat and cook over low heat for about 25 minutes. 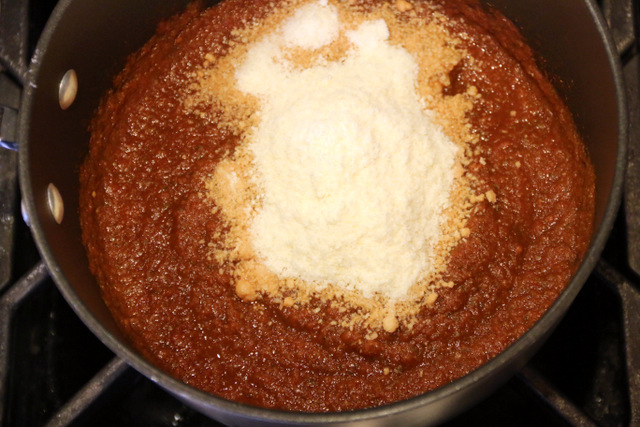 Add the ½ cup of grated parmesan cheese, mix well and cook for another 5 minutes. Save the sauce until needed. 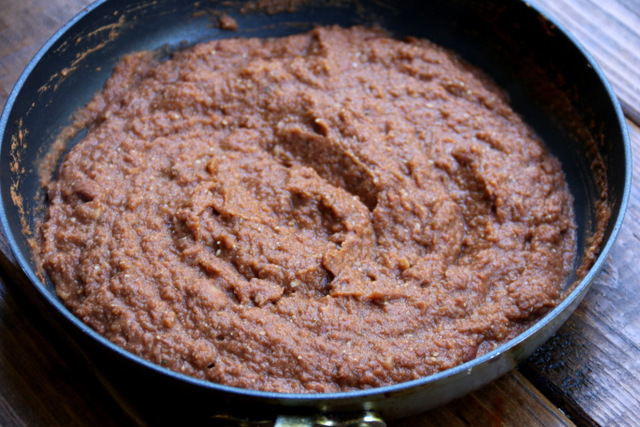 Combine the refried beans and the sauce in a pan, mix well and cook until fully heated. Can be used immediately or saved until needed. 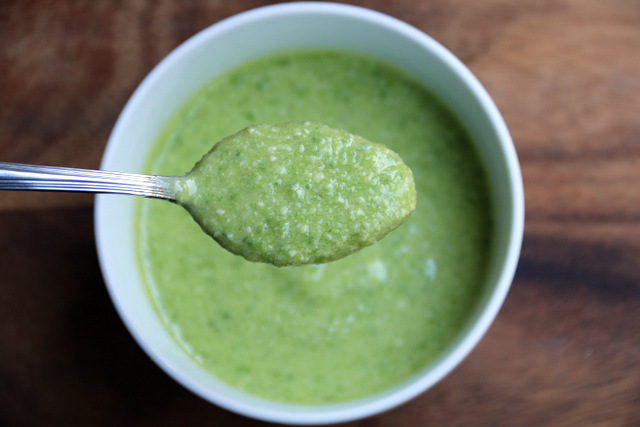 Combine all the ingredients in a small food processor or blender, mix well until you have a smooth sauce. 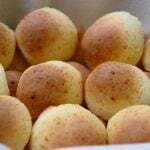 Can be used immediately or refrigerated until needed. Whisk lightly before serving. 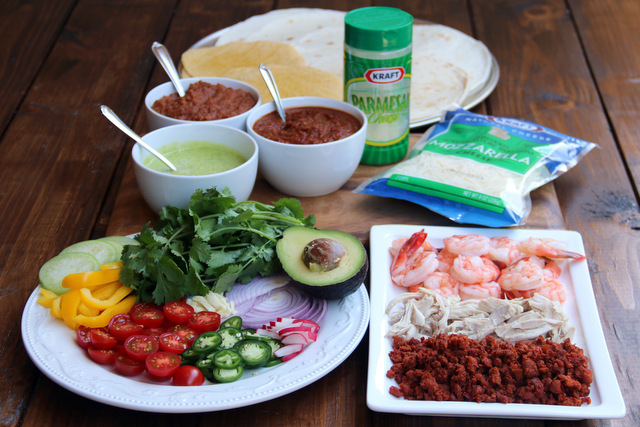 Have the tortillas, sauces, and toppings prepared and ready to go. 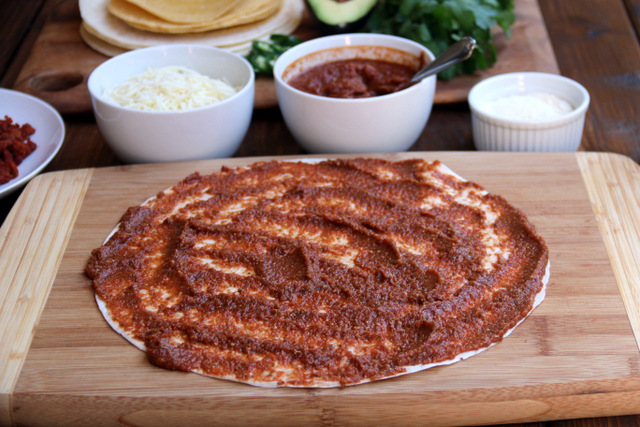 Spread a layer of the tomato sauce or bean sauce on top of each tortilla. 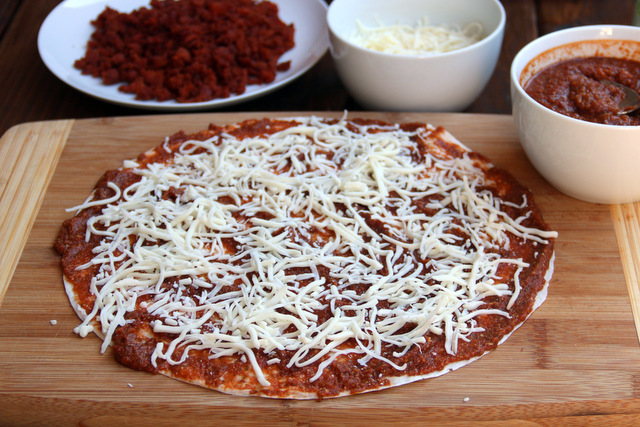 Next, sprinkle a layer of the grated parmesan and shredded mozzarella cheese. 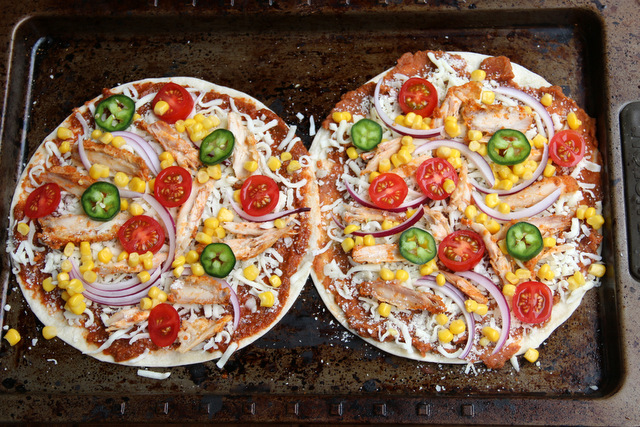 Add the toppings of your choosing. 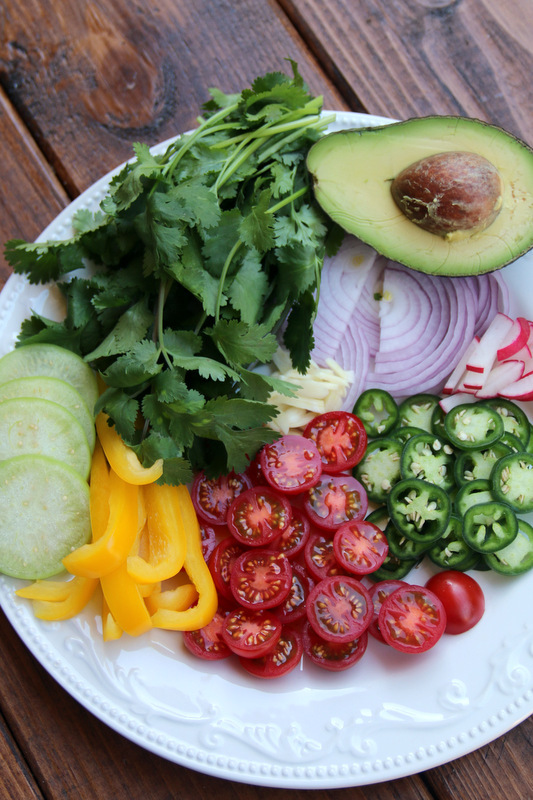 The avocado slices and fresh cilantro leaves are best if added after baking. 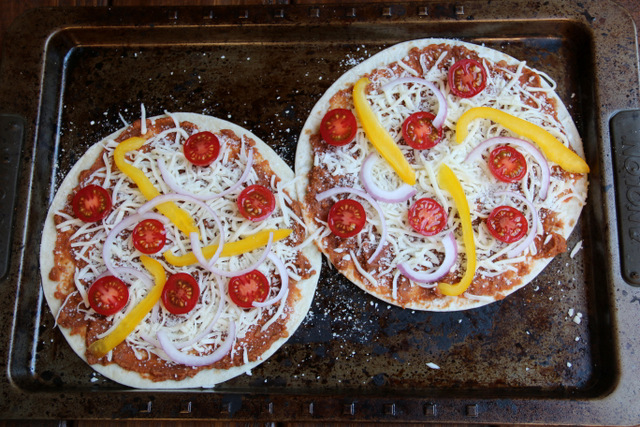 Place the tortilla pizzas on a baking sheet (doesn’t need to be pre-heated) and bake for about 6-8 minutes or until the cheese is melted and the tortilla edges start to get golden and crispy. 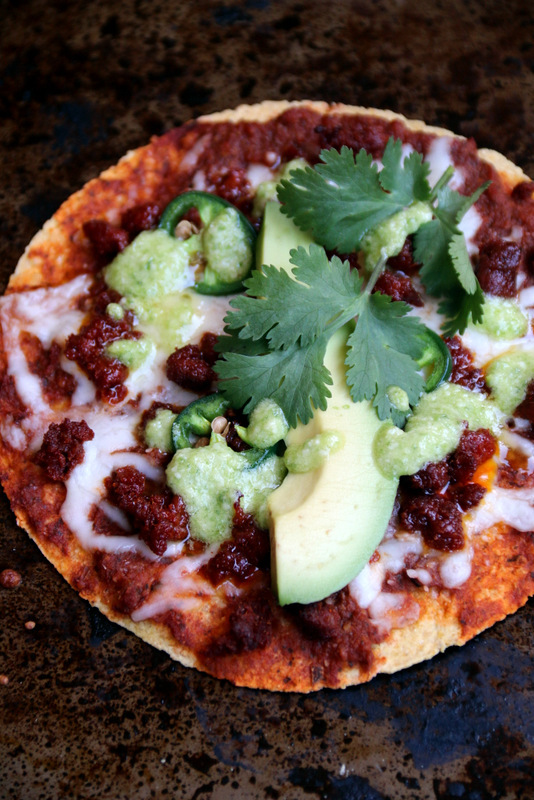 The exact baking time will vary based on the tortilla size, the amount of toppings, altitude and your oven. 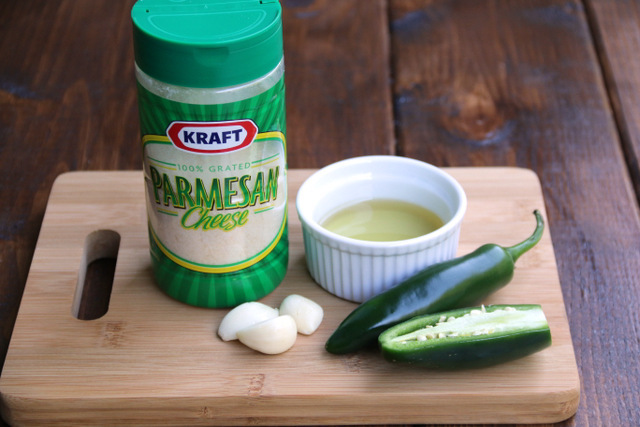 Add the additional fresh toppings, garlic jalapeño parmesan topping sauce, and/or additional grated parmesan and serve immediately. 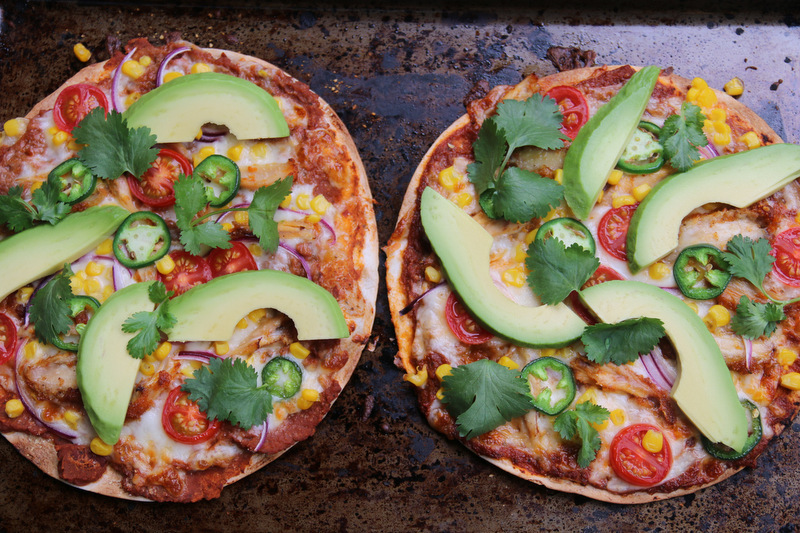 I made both a spicy tomato pizza sauce and a refried bean sauce for these tortilla pizzas. 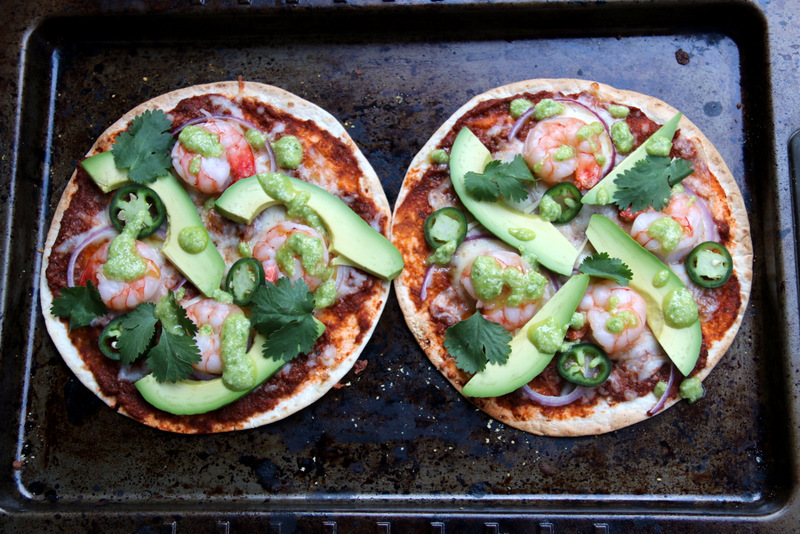 You can make both or just the tomato one. 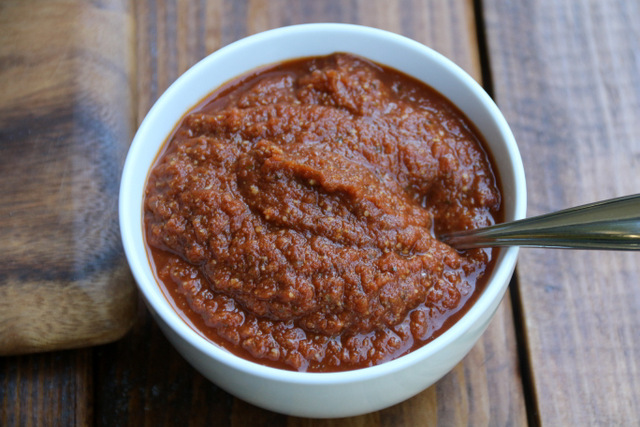 The spicy tomato sauce is really easy to make, you just blend diced tomatoes (canned or fresh) with garlic, onions, hot peppers, herbs, cumin and tomato paste. 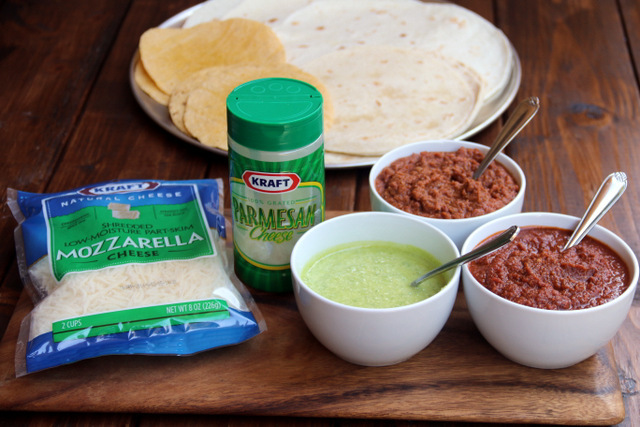 Cook the sauce for about 25 minutes, add some grated parmesan cheese at the end, and you have a flavorful spicy pizza sauce. You can adjust the amount of hot peppers according to your preference, and also adjust the herbs based on what you have available or the flavors that you prefer. 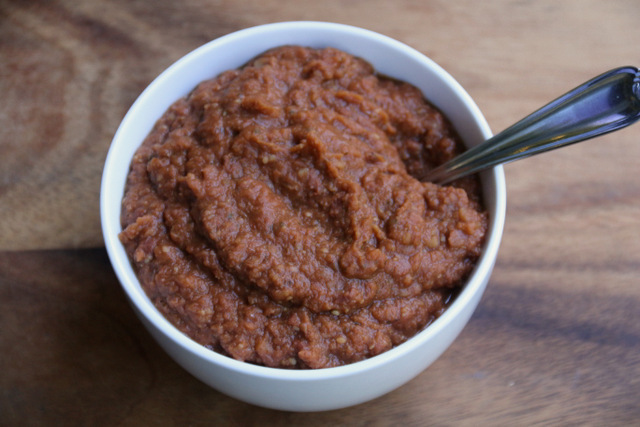 The refried bean sauce is made using refried beans, store-bought or homemade, mixed with some of the spicy tomato sauce. 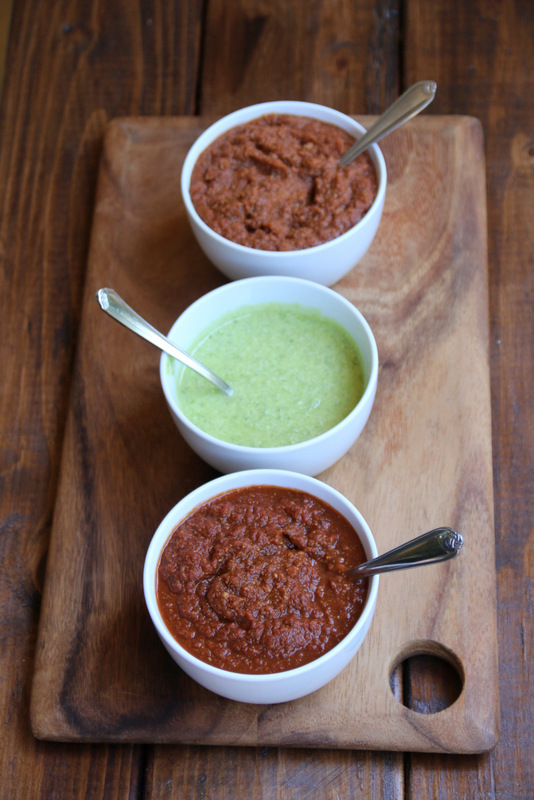 Both sauces can be made ahead of time and kept refrigerated until ready to use. I also prepared a garlic jalapeño parmesan topping sauce to drizzle on top of the pizzas when they come out of the oven. 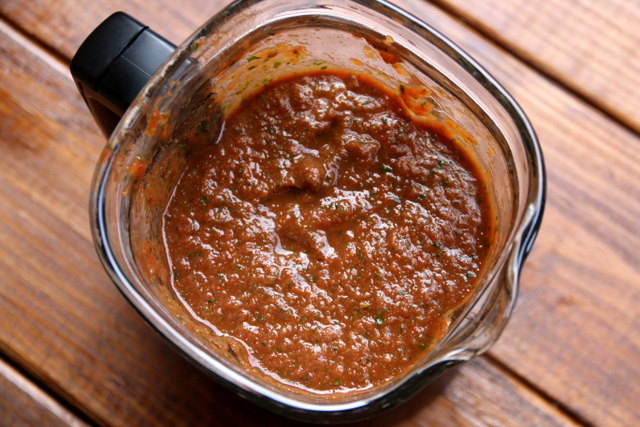 This sauce is also very easy to prepare, simply blend olive oil, garlic, jalapeños to taste, and grated parmesan in a blender or mini-food processor. 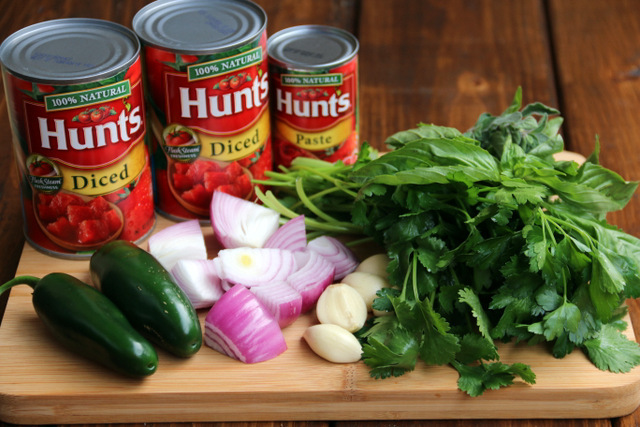 Same as with the tomato sauce, feel free to adjust the amount of garlic and hot peppers according to your taste. 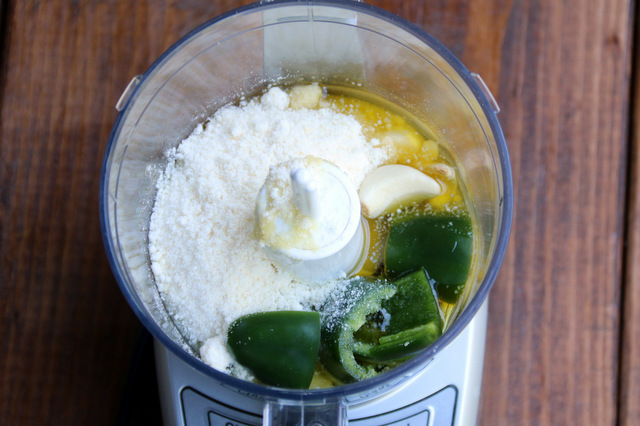 Jalapeños are usually mild, especially if you remove the seeds and veins, so they usually give more flavor than heat. However, their heat level tends to vary from one pepper to another or from one season to another. 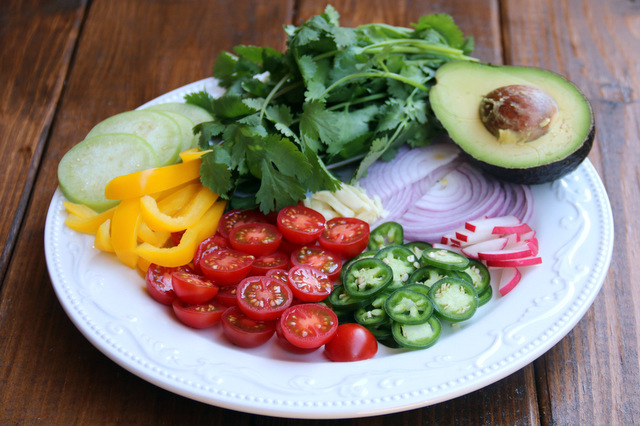 If you want a spicier pepper, try the smaller Serrano peppers. If you want a pepper that’s less spicy, try Anaheim peppers. 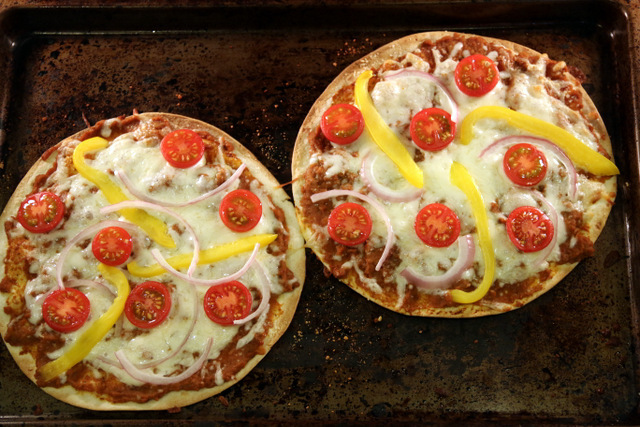 I baked these tortilla pizzas because right now it’s way too cold to go outside and grill, but during the summer they can be made on the grill. 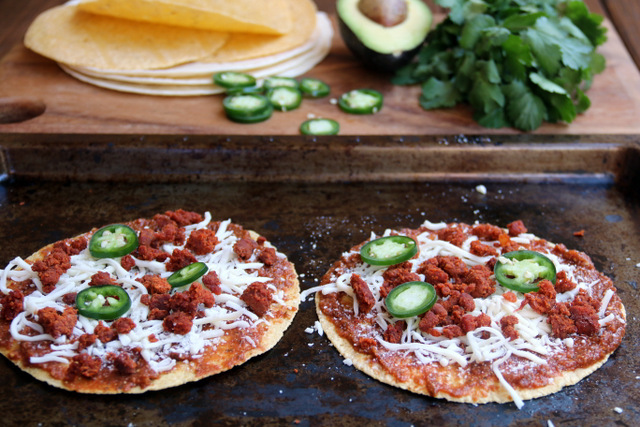 These tasty thin Mexican pizzas can be made with flour tortillas or corn tortillas, you can use large tortillas or small ones– it’s all customizable. 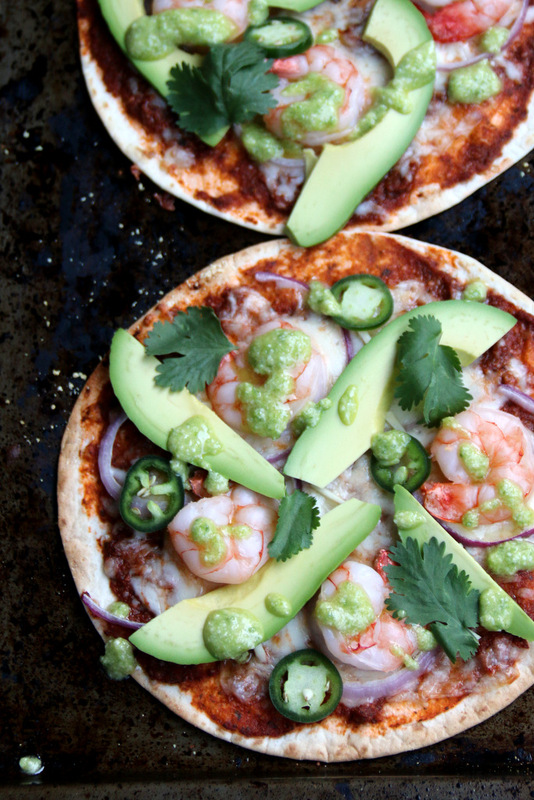 You can make a few large ones to share or everyone can choose their own toppings. For topping options, you can mix and match as you wish. 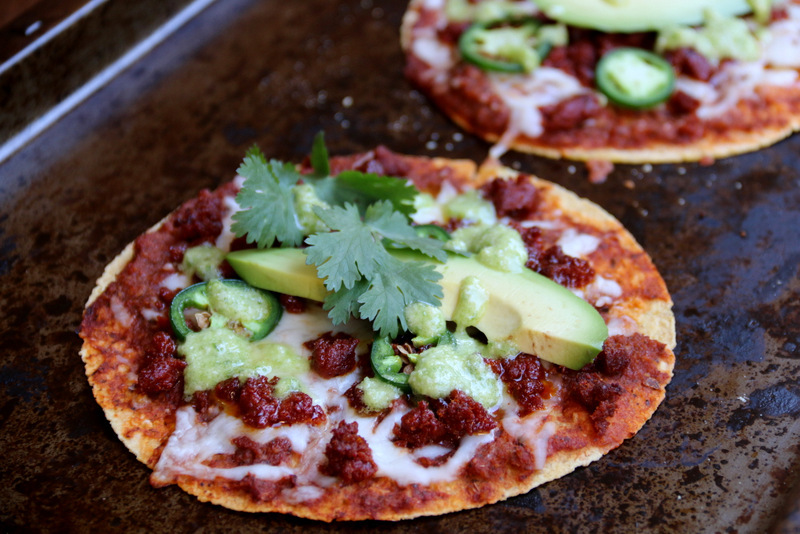 Chorizo, fully cooked, is a must have for these tortilla pizzas. 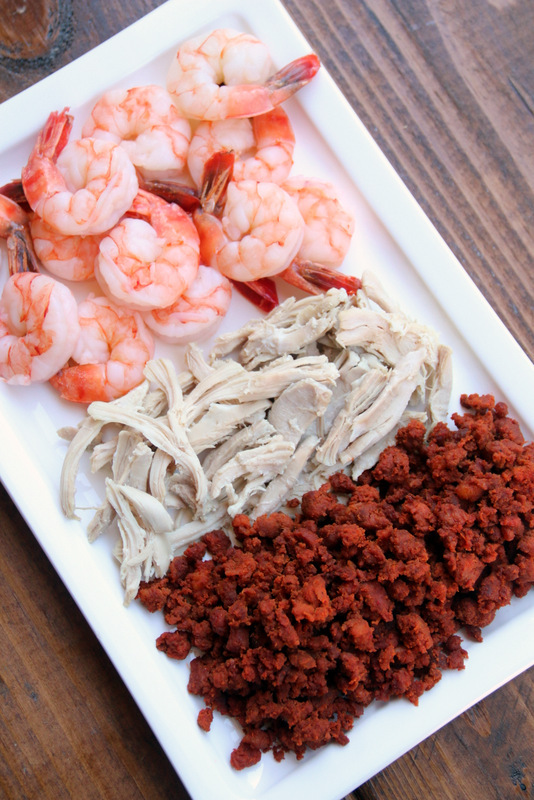 You can buy the fully cooked chorizo sausages and slice them thinly, or use cooked fresh chorizo. 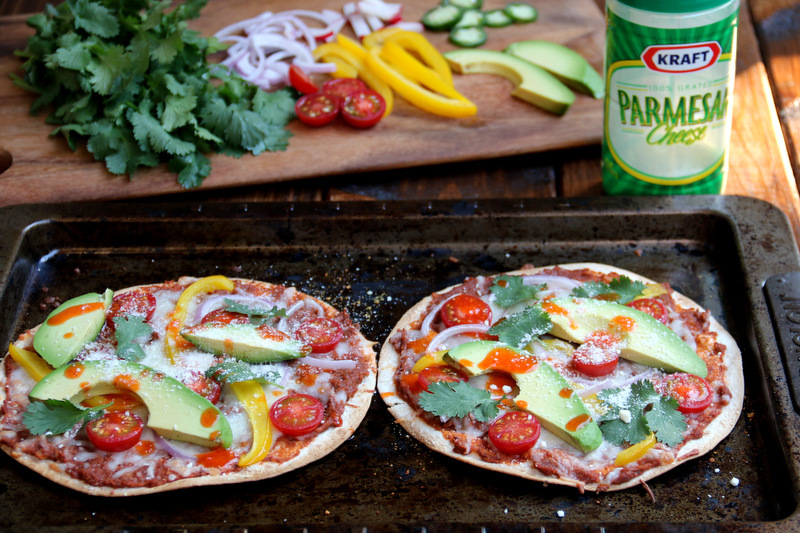 These easy to make pizzas are also a great way to use pantry items and leftovers. 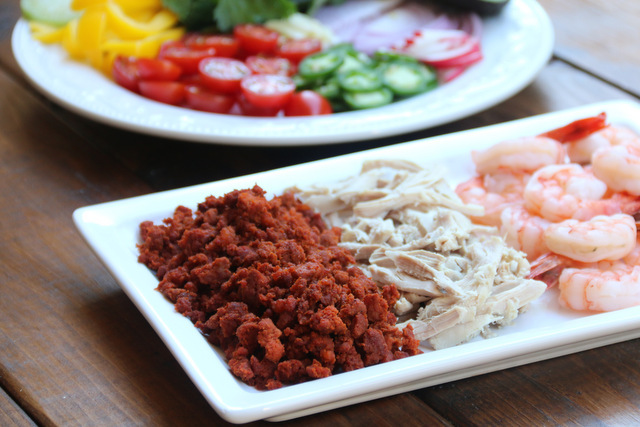 Whenever we have roasted or rotisserie chicken; we usually have leftovers – not enough for a full meal, but enough to shred and use as a topping. 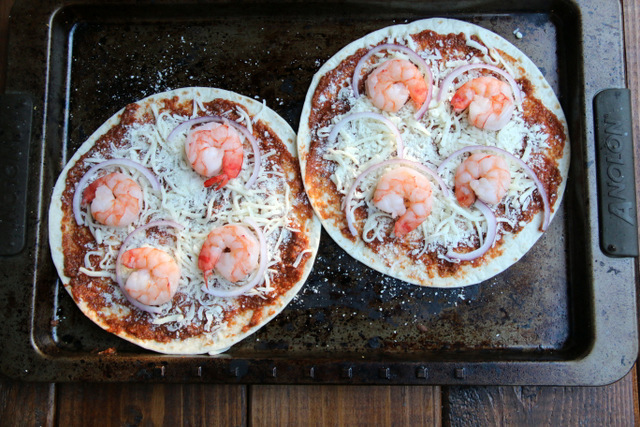 You can also use leftover steak, just slice it thinly or leftover grilled pork/salmon/shrimp/etc. 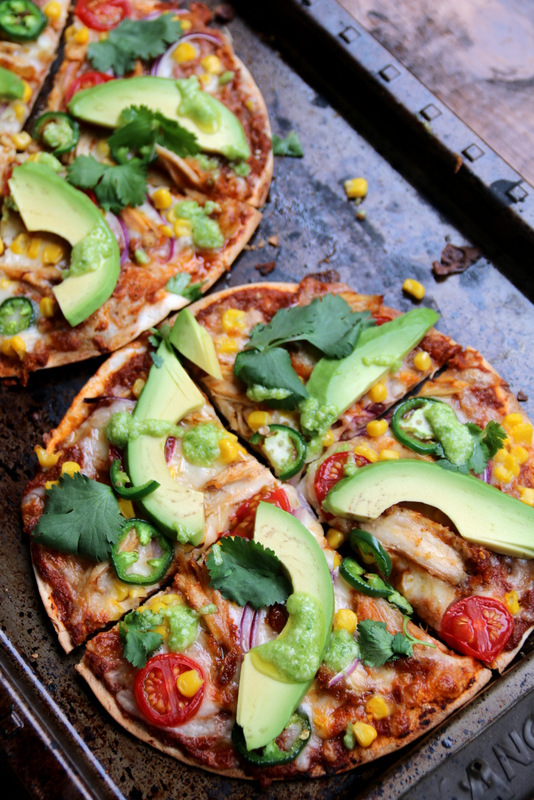 I am crazy about avocados and cilantro so I almost always add them as toppings, but after the pizzas are done baking as I prefer their taste to be very fresh. 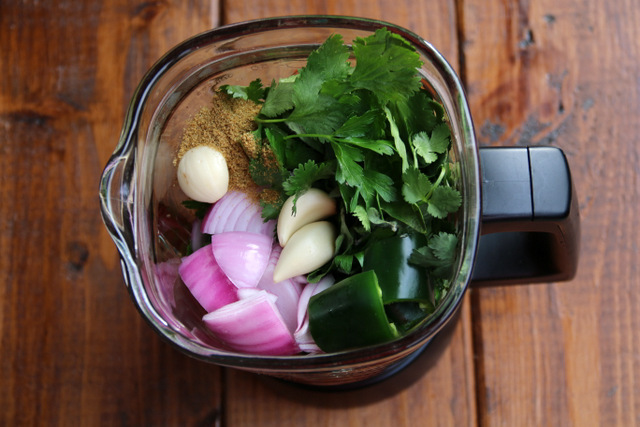 You can also use fresh basil or other herbs in place of the cilantro. *Disclaimer: I am working in partnership with the KRAFT brand and I am receiving compensation for my participation in this campaign. 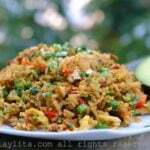 All photos, recipes, opinions and ideas are 100% my own. I changed the recipe a little bit, but it still came out wonderful. 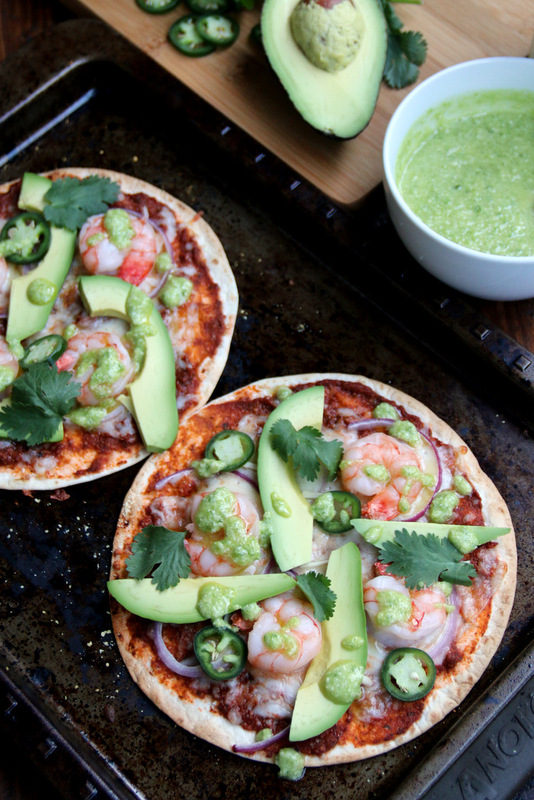 What a great idea, using tortilla like that! He cambiado la receta un poco, pero aún así salió maravilloso. 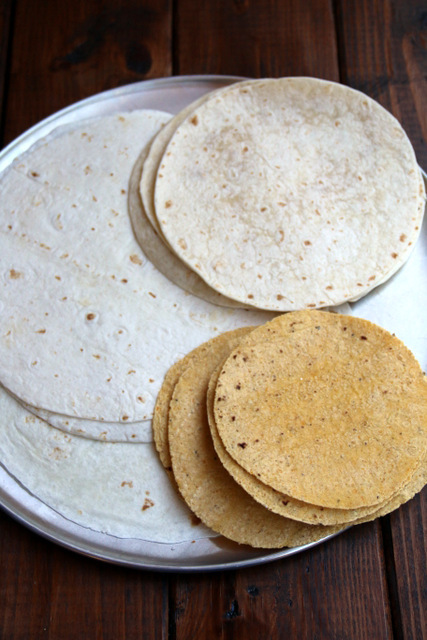 ¡Qué gran idea, utilizando tortilla de esa manera! I have been doing this for 20 years. 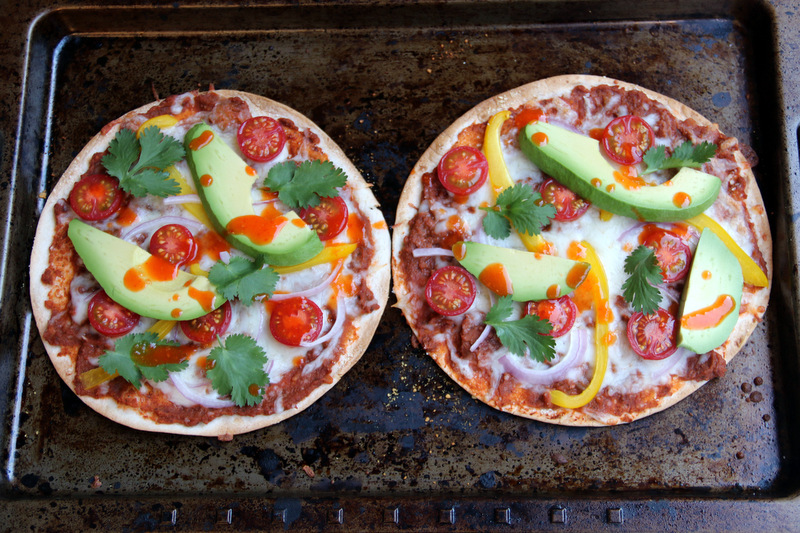 I use two tortillas per pizza. 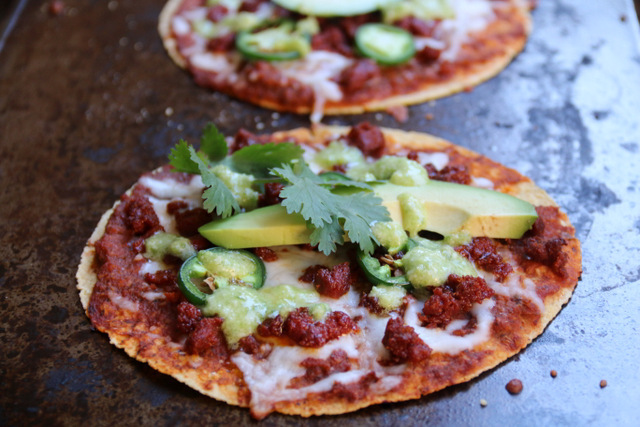 Put first tortilla down and apply a small amount of grated cheese, put second tortilla on top of first one then make pizza on top of that. Makes it thicker and doesn’t flop. Love this! so many pictures to drool over!